Nigel and Louise welcome you. Chandar our new head chef is making the most of fresh food and our new menu changes regularly. and international cuisine. Chandar is the Head chef and has many years of experience having worked previously at several 2 AA rosette restaurants with in the UK. Having recently joined the team we are delighted to have Chandars input into design of our menu /specials of the day and themed menus. Our second chef Stuart has also a wealth of culinary skills and was a trained pastry chef who is great for all the pies and cakes that are so ever popular. and everyone’s happy you feel a sense of satisfaction that makes the effort all worthwhile. 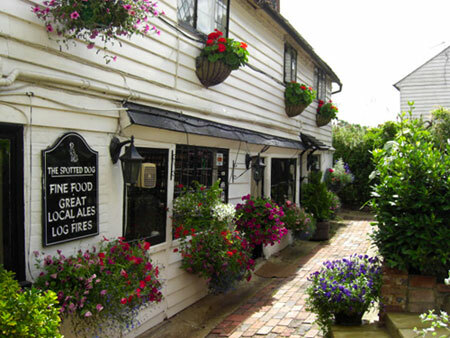 The Spotted Dog is a beautiful 15th Century country Inn, full of character, located on Smarts Hill in the picturesque village of Penshurst. We are located just six miles from Royal Tunbridge Wells and close to local tourist attractions such as Penhurst Place and HeverCastle. The Spotted Dog Public House is a 500year old building which originally started out as 3 cottages.We are still a traditional country pub with good home cooked food with a great family atmosphere, popular with both locals and visitors.We are located a 5 minute drive from the pretty village of Penshurst , location of the beautiful Penshurst Place which has been occupied by the Sidney family since 1482, The current owner, The Viscount De L’sle MBE, is her Majesty’s Lord Lieutenant of Kent. · There is no direct bus to the door. The 231 bus form Tunbridge Wells to Edenbridge stops at the bottom of Smarts Hill. The service is infrequent, with no buses in the evening, on Sundays or on Public Holidays. The timetable is available at www.metrobus.co.uk. There is no direct bus from Tonbridge. · Nearest railway station is Penshurst which is 3 miles away. · Taxis are available from Tunbridge Wells, Tonbridge & Hildenborough stations. We can arrange a taxi to pick you from the station if you require. · Both sets of steps into our establishment have handrails. As you look at the building, the left hand side has 17 steps at 5 inches high. The right-hand side has 5 steps at 8 inches high. · The main door into the building has a raised step of 2 inches with a drop of 10 inches, the door height is 5ft. The floor is then level to a second door. · Coming through the front door, you will be directly opposite the bar, there are no steps or uneven floors in this area. · To the right of the main entrance there are ( however many) tables at which you eat. The tables have upright wooden chairs and cushions for comfort. There is at least 8 inches between the seats of the chairs and the table tops. · There are 8 stools located along the bar. · There is low background music playing. 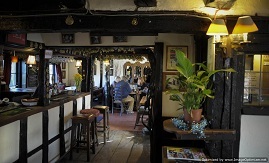 · To the left of the main entrance is a beautiful large inglenook fire, which attracts a lot of interest, with 3 further tables for either eating or just enjoying a drink. · Through a doorway, you will find yourself in the restaurant which can seat 33 persons. · All tables, both in the bar and restaurant, are waitress service for food orders, but orders can be placed at the bar if you desire. 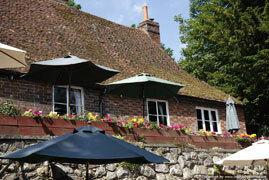 · Monday to Thursday Lunchtime we offer a 2 course set menu for £10.95 or a 3 course for £12.95. · The height of the lowest beams in the bar are 6ft. · Customer toilets are located outside the front entrance. · Ladies’ toilets have one small step into the door. There are 2 cubicles, 2 hand wash basins with easy to use handles a paper towel dispenser. Toilets are 16 inches high with no grab rails. · Men’s toilet have one cubicle with a toilet of 16 high with no grab rails. There are 2 urinals at 28 inches high, a hand wash basin and a paper towel dispenser. · There is no wheelchair access in any of the toilets. · Both ladies’ and men’s toilets have tiled flooring. · At the front of the property we have 2 terraces which are accessed via the front steps. The top terrace is accessed via the lower by 4 steps of eight inches high. There are tables with seating for 70 persons. Smoking is allowed on both terraces. · All tables are wooden with either benches or upright chairs. · Eating is allowed at these tables but orders must be placed at the bar. · The rear terraces are accessed via a door in the bar area. There is one step of 8 inches onto a brick paved area. · The top terrace has seating for 50persons. The wood floor are is non-smoking. · The lower terrace is paved with slabs and is accessed by a flight of 12 steps eight inches high with a handrail. · There is seating for at least 60 persons. · Eating is allowed at all tables but orders must be done at the bar. · We have two first aiders on site, but all staff are informed on how to call for help if needed. · Dogs are welcome within the bar area and water bowls are provided. · Internet is available in all areas and is free of charge. · We can cater for special occasions in our restaurant for up to 33 people. · Local accommodation can be found on our notice board just inside a front door.